So I have been practicing my freehand temporary tattoos on my boyfriend. 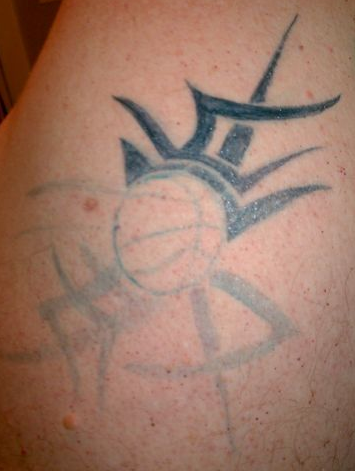 I figure if I get good a drawing the art work on freehand then it will be really easy for me to trace the tattoo transfer. 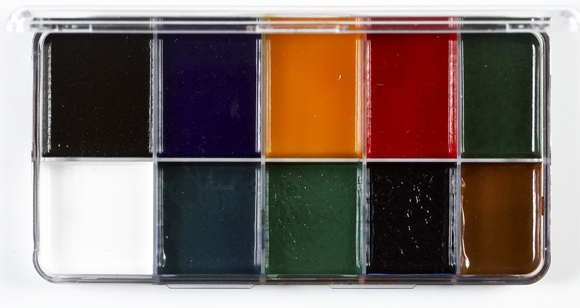 I used my Temptu pro palette in “Inked”, three different size fine point brushes and 99% alcohol. I know some people talk crap about Temptu’s palettes but I wanted to test them out for myself. I noticed you have to let the alcohol soak into the color for a while to get a think consistency. But overall, it got the job done. 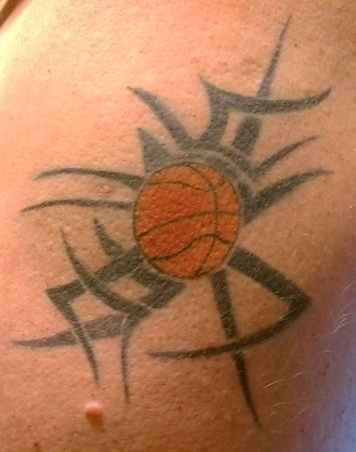 My boyfriend loves basketball so he picked one he liked on the internet and decided he wanted it on his left shoulder. I did a light outline to get the shape the way I wanted. If the line wasn’t right, it would be easy to wipe off with 99% alcohol and try again. 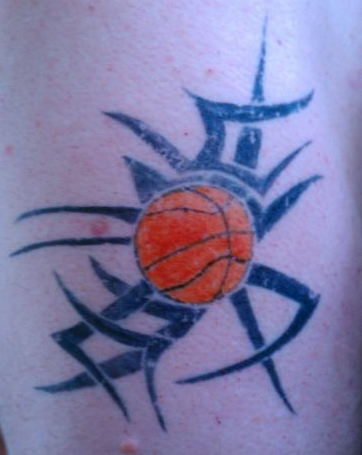 After that I added the orange color of the basketball. I mixed the “Prime Yellow” and “Prime Red” to get this color. Lastly I powdered the tattoo, with a colorless powder, to make it look slightly faded and more like it is part of the skin. I let it set and sprayed it with Aqua Set. Here is a pic of the tattoo after 1 week. My model was careful not to rub it when he took a shower, and he gently patted the area dry. It could use a touch up and a little powder but for the most part, it held up pretty well. 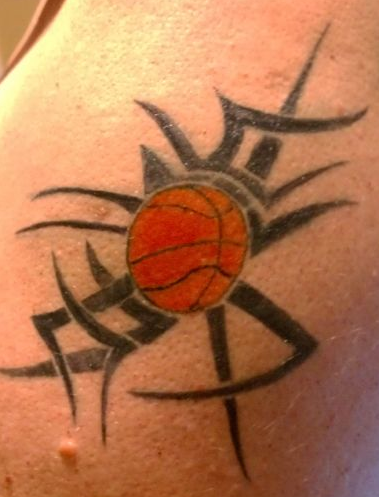 The hardest part for me was the thin lines on the basketball. It was tough getting the consistency of the ink just right to make the line thin but still show up. Also, keeping the clean space between the lines was tricky, since the ink will bleed a little if it’s not thick enough. This is the second temporary tattoo I have done on this model. I just started practicing a few weeks ago. It is something that I want to continue. With time I believe my freehand temporary tattoos will get better, and make tracing the tattoo transfers easy as pie, because I will be comfortable with the way the ink flows. Please feel free to leave comments and let me know what you think. 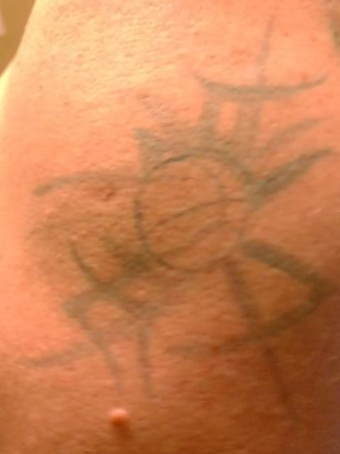 If you have done a temporary tattoo, I would love to hear about it. That is a great idea! My sister wants to try it out 🙂 By the way… thank you for being so supportive of my blog! Your comments are very encouraging.